There are inevitable truths when it comes to discussing South Africa. Apartheid was a significant misstep in the history of social progress, and still casts an enormous shadow over the state of affairs. It would be wrong to state that every white South African was complicit in the legislation of Apartheid, but it would be worse to state that the end of Apartheid was the result of white benevolence. From the very beginning, South Africa has been a multiracial state, much like the United States, and fear of losing power and control influenced ideas of racial superiority as a restrictive counterweight to progressive societies. Leaders who inspire like Nelson Mandela are few, and those who have come before in history often paid for the insurmountable with their own lives. No country is perfect, but South Africa still moves towards justice and equality for all, and have done their part to accept the mistakes of the past. It is to humanity's benefit that our history is not a vacuum, but a constant reflection on how we can become better. The story of wine is often the story of soil type. Climate is a huge influence-of course, but soils are essential to proper viticulture. Thanks to curious composition over millennia, soil of South Africa mainly composed of Malmesbury shale, Table Mountain sandstone, and Bokkeveld shale, allowed for fertile agriculture in the region, especially in the area of the Western Cape, where mountains sealed off the coast from the high climate of the surrounding region. Our wines of the week are found along the Western Cape, within the regions of Stellenbosch and Hermanus. At first, South Africa was little known to Europeans beyond the coast that trade ships passed looking for the riches of India. What is now Cape Town was then known as Cabo das Tormentas (Cape of Storms)-simply the resting point before making the journey around the continent to trading hubs like Mumbai. It was the seafaring Portuguese that made initial landfall in the late 1400s, and their King John II would rename Cabo das Tormentas as Cabo da Boa Esperança - the Cape of Good Hope, for the promise of riches that lay further on in the journey. Still, it was the Dutch who would make permanent roots on the mainland, establishing Cape Town in 1652. Viticulture was not far behind, as seven years later, on Feb. 2, 1659. Jan Van Riebeck, who had led the first Dutch settlers ashore seven years earlier, wrote in his diary: "Today, praise be to God, wine was pressed for the first time from Cape grapes." However, it was vineyards some 20 kilometers south of Cape Town that would bring South African wines international acclaim. There's a story that when Louis XVI's wine cellar records were discovered some years after his death, he had no Bordeaux, some Burgundies, and many thousands of bottles of Constantia. No matter the truth of the tale, Constantia was well recognized, and highly sought after in the wine world. Due to the nature of the long journey, Constantia was a dessert wine made from Muscat de Frontignan, which had been brought to the country by French Huguenots. Even in those early days, efforts were made to segregate black workers from white settlers to the extent that "Cape colored", Southeast Asian workers, were specifically brought in to work the vineyards in the Western Cape. But in the late 1800s, Phylloxera reared its aphid head in South Africa and devastated the overall crop-and the international market for South African wine. Thus, vintners made the decision to bring in Cinsault, a high-yield grape, to help bring back an international market. The move backfired, as South African wine soon became synonymous with "cheap and cheerful wines". In 1918, KWV (Ko-operatieve Wijnbouwers Vereniging van Zuid Afrika) was formed to create a quasi-quality control where wine production for the whole nation was limited by quota. Although this helped South Africa avoid flooding the market with inferior product, the quota made no distinction for quality wines. Worse, in 1948, the National Party assumed legislative control of the government, and created the apartheid system. One of the first acts of legislation was the Group Areas Act in 1950, which assigned racial groups to different residential and business sections. In effect, this forced the removal of non-whites from the "wrong" areas, and further encouraged the use of "Cape Coloreds" as the preferred vineyard workers. Born in 1934, Tim Hamilton Russell began his career as an ad-man for J. Walter Thompson. The agency, established in 1864, became famous for the "I Wish I Were An Oscar Meyer Weiner", and the first simultaneous global ad campaign for the Kodak Instamatic. But when he reached his forties, Russell wanted to create something with even more longevity, wines that South Africa could be proud of. He purchased land in 1975 in Hermanus, and brought cool climate varietals like Chardonnay and Pinot Noir to one of the few regions in South Africa that could sustain them. By this time, KWV had ballooned to some 5,000 members that controlled 80% of South Africa's wine market. Russell had to wait to purchase someone's unused grape quota before he could begin to make wine, but that wasn't the last problem. Thanks to an arcane agreement that allowed the importation of South African crayfish to France, South African wines could not be labeled with French names, and further still, cool-climate varietals weren't permitted to be grown for wine production until they had undergone 10 years of rigorous testing for disease control. Despite all of this bureaucratic backlog, Tim produced his first wine, Grand Vin Noir, in 1982. Thanks to his persistence, the KWV relented on its quota system, and in the mid 1980s, Tim Hamilton Russell helped draw up the Winelands Commitment, which was "dedicated to the constant improvement of South African wines, recognizing our objectives cannot be properly achieved in a country dominated by issues of race and inequality. "The four initial members said they were committed to "the principle that all land and vineyard ownership be opened unconditionally to all races, and that the Group Areas Act be removed," as it has been; to "freedom of association for all our colleagues and employees," and to "the ending of apartheid policies in South Africa." This was in 1989, and even then, few winemakers, even if they agreed with the sentiment, worried about their opinion being made public. But the Apartheid government was starting to lose its control, and the Group Areas Act was removed in 1990. 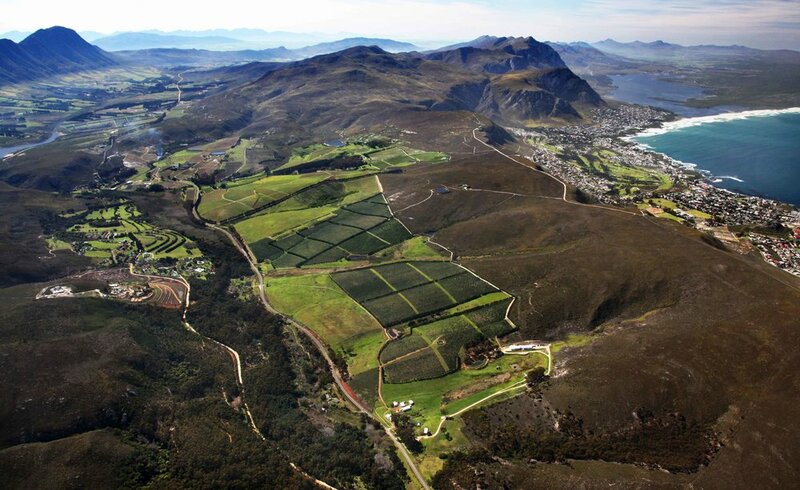 A birds eye view of Hemel-en-Arde, a designation in Hermanus that Tim Hamilton Russell created in the late 1970s. Now, of course, Hamilton Russell can label their wines as Pinot Noir and Chardonnay, and they are proud of their sustainable vineyards and the wine they produce. We're extremely lucky to have the 2017 Chardonnay and 2016 Pinot Noir in stock. 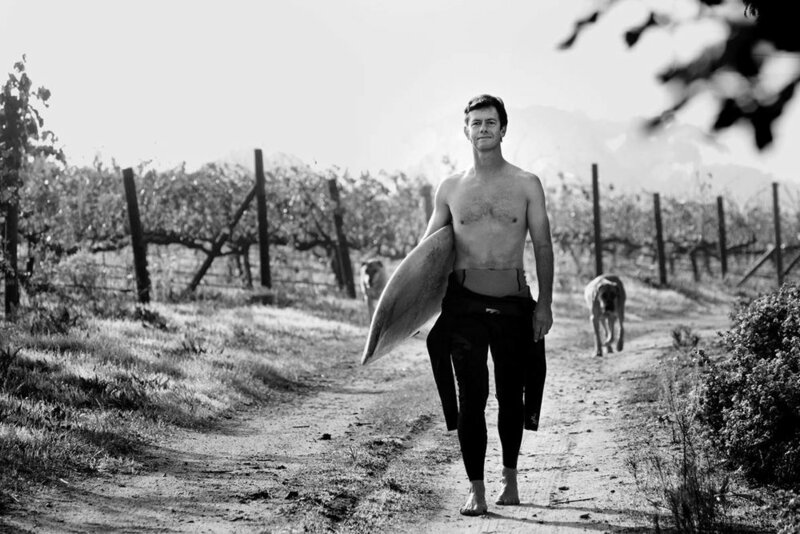 Tim Hamilton Russell may have helped pave the way for high quality wine production, but South African wine today is thriving with young producers dedicated to that mission. Johan Reyneke is one such producer, and his Reyneke wines are South Africa's first officially certified biodynamic vineyards. Located in the Polkadraai Hills to the west of Stellenbosch proper. Reyneke produces South Africa's most prominent white grape, Chenin Blanc alongside Sauvignon Blanc, Semillon, Syrah, Cabernet Sauvignon, and Merlot. Comprised of 37 hectares, the Reyneke vineyard has been biodynamically certified since 2004. Everything there is recycled and harvested by hand, to the extent that Johan even uses old cow horns to bury the manure important to keeping the soil thriving. Reyneke first came here with his family shortly before graduating with a philosophy degree in 1988, and though the farm had been an established property in Stellenbosch since 1863, the farm didn't produce any wine until 1998 . Now, with the international wine community hungry for natural and biodynamic wine, Reyneke is a critical darling, leaving luminaries like Jancis Robinson impressed with the results. These wines don't come our way all that frequently, but we're super excited to have the Reyneke Biodynamic Chenin Blanc as part of our featured tasting.